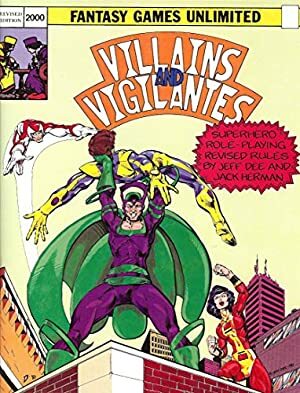 Villains & Vigilantes is an early (1979) pen-and-paper super-hero super-hero role playing game. We have a fairly large selection of characters from that game, with DCH stats. They’re here in no small part due to nostalgia. But they also are interesting stock characters in that they can be easily inserted into stories, conveniently filling their niche. Group Affiliation: Former member of “The Company”, Crusaders. Base Of Operations: Center City. Height: 6’1” Weight: 212 lbs. Eric has the ability to project a force field around his body. This ability is due to the serum that he was given. He is also a highly trained agent, especially in firearms. Eric Forrest worked for “The Company”. He was what is known as a Free-Stationed Representative. Whenever “The Company” had any trouble, anywhere in the world, they would send a man like Eric Forrest to straighten it out. He had “The Company’s” permission to do anything necessary to put an end to the trouble. Eric liked his work and was very good at it. He was a secret agent in good standing. One job “The Company” gave him was guarding an important scientist, one Doctor Freidrich, from some members from another organization who considered the good doctor to be a problem. This would be Agent Forrest’s last mission. The doctor was working on a formula to develop a human’s mental force as away to protect him and make him invulnerable. The formula really did work, but unfortunately, that made “The Company” think that the doctor and his formula were both too dangerous to remain extant. Disobeying orders, Eric tried to protect Dr. Friedrich anyway and the doctor gave him a dose of the formula. Despite Eric’s brave actions and the formula, Dr.Friedrich was eventually killed. After this, Eric resigned from “The Company”. Eric is tall and has a muscular build. 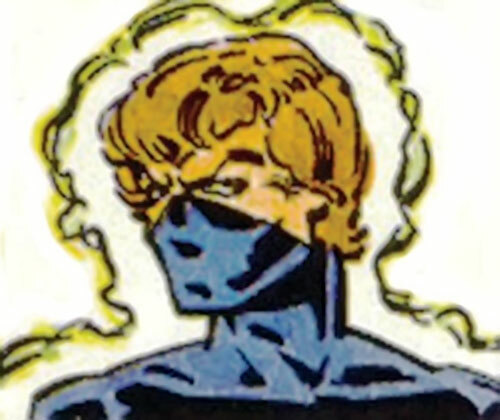 He wears a black body suit that has a mask that covers the lower part of his face (similar to a ninja mask). His force field shimmers all around his body when it’s on. His pistol looks like a standard automatic pistol with an extended clip. Enforcer was once a great agent. His tactics are usually to block anyone trying to escape and blind them with a flare shot from his gun. 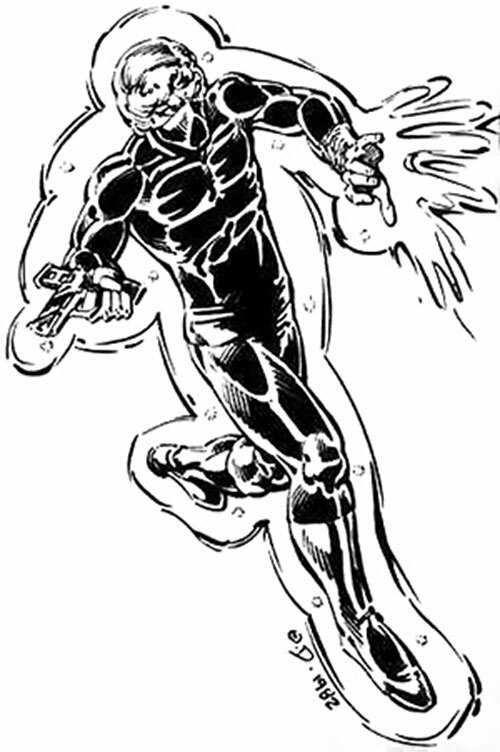 Any still in fighting shape he pommels with explosive bullets (for dangerous enemies) or mercy bullets (for lesser). If Mercury Mercenary shows up, Eric concentrates all attention to him. “The Company” could easily be replaced with Checkmate or the DEO. The rival organization reeks of Kobra and could easily be used. It’s possible that Eric may even know a few other “super-spies” from those organizations. Center City could be replaced with Central City as well, giving the Crusaders an interesting Base of Operations. Intensive Training, Iron Nerves, Sharp Eye. Crusaders (High), “The Company” (Low). Arch Enemy [Mercury Mercenary], Dark Secret [Member of “The Company”], Guilt, Secret Identity. Enforcer’s Multi-Gun [BODY 05 EV 07, Range: 10, Ammo: 06, Bomb: 08, Flash: 08, Paralysis: 05, R#03, Bonuses & Limitations: Bomb only has an Explosive Radius of 0 APs; Paralysis represents “mercy bullets” — roll a normal attack using EV with a +1CS to the target’s RV (Bashing Damage only) and if the attack inflicts RAPs then Check for Paralysis. A superbly crafted pistol]. By Grayson Thorne from a Jeff Dee V&V writeup. Source of Character: Villains & Vigilantes RPG Adventure: Crisis at Crusaders Citadel.